I'm not going to vote for her if she somehow manages to win the Democratic nomination, but I have to hand it to Park Ridge, Illinois native Hillary Clinton--it was smart for her to enter the lion's den and agree to appear on the O'Reilly Factor. On top of that, she was poised, and she answered Bill O'Reilly's questions well--particularly when O'Reilly confronted her on the fact that as president, she'll be working to raise the pundit's taxes. And shame on those Democrats, including Hillary Clinton, who took park in the de facto boycott of the nation's most popular cable news network. Senator Clinton appeared on the O'Reilly Factor. The sun will rise tomorrow. Summer will follow spring. Rivers will flow downstream. Sen. Schumer panic peddling on "recession"
As I noted earlier today, for the second quarter in a row, the US economy grew at an anemic rate of 0.6 percent. We are not in a recession. Some Democrats seem to enjoy wallowing in misery, however. The chairman of the U.S. Senate Joint Economic Committee, Democrat Charles Schumer, argued that the data shows the economy has "stalled" and that 90 percent of Americans are experiencing a recession. As Brit Hume noted on the Fox News Channel a couple of hours ago, recession is a macroeconomic term, which is why many universities mandate a basic economics course as a prerequisite to graduate--so they can accurately what is going on in regards to fiscal matters. The generally agreed upon defintion of a recession is two consecutive quarters of negative growth. Schumer must have gone to a college that doesn't require Economics 101 for its students. Meanwhile, according to the results of a poll released today, Eight in ten Americans believe we are in the midst of a recession. The economy has slowed down. But we can thank people like Chuck Schumer for leading Americans into a group-think that we're in a recession. Schumer is the chairman of the Democratic Senatorial Campaign Committe. Before I took part in a teleconference this afternoon, I ran a 10-miler. 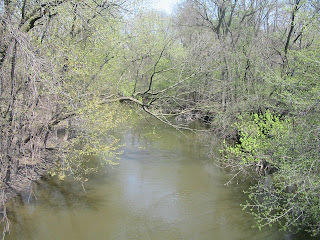 As you can see, leaves are starting to come out on the trees, as this picture of the North Branch of the Chicago River in St. Paul Woods in Morton Grove shows. Scroll down a few posts, and you'll see that wildflowers are blossoming throughout the wooded areas near where I live. How would you like it if your state surrendered its sovereignty to another state, say, California? It could happen in Illinois. Requires 36 billion gallons of renewable fuels annually. This afternoon I participated in a teleconference with Charles Territo of the Alliance. Where does California fit in? Part of that bill allows states choose the California standards. I live in Illinois, I do not, nor can I, vote in California elections. If HB 3424 becomes law here, California legislators and bureaucrats will be deciding not just what our automobile emission standards should, but if they change those standards, Illinois will have to follow suit. This will limit the types of vehicles that can be purchased in Illinois. For instance, late last year, Chrysler began selling a diesel version Jeep Grand Cherokee Laredo. It cannot be sold in California and eight other states. Illinois could be next. For you scofflaws out there who think they can travel to Indiana to buy one, registering it with the Illinois Secretary of State's office won't be possible--HB 3424 won't allow it. Does the auto industry care about clean air? During the teleconference, Territo said, "the auto manufacturers 'gets it.'" America needs a more CO2-efficient society, and a new fleet of CO2-efficient autos will be dominating the marketplace. Automakers are addressing climate change through energy bill provisions that will result in a 30% reduction in CO2 from autos by 2020. By reducing CO2 by 30%, automakers will lead all industries in setting a clear path to meeting the recent United Nations Bali Climate Change Summit’s goal of a 50% reduction in CO2 emissions by 2050. There are sound reasons for federal law in all 50 states. Federal law does not allow states to set their own vehicle safety laws. One state cannot decide to have more airbags in autos, for example. Federal law does not allow states to set their own food labeling laws or packaging laws because such state laws would create marketplace chaos. Illinois laws for Illinoisans. One emissions law for all Americans. 'Nuff said. One of the co-sponsors of HB 3424 is my state representative, Lou Lang. I'll be e-mailing Lang this post. And yes, I care about the environment. About this time last year, part of Obama's stump speech was about the need to combat cynicism. I'm sure there are plenty of members of the Cult of Change feeling pretty cynical this morning. So why did (the Detroit NAACP and National Press Club performances) by Wright finally create the need for Obama to speak up more forcefully? That answer is simple: falling poll numbers in Indiana, North Carolina and nationally, and to that, we can safely conclude, Barack Obama takes great offense. One of the charter members of the Obama media worship team, Chris Matthews, has already compared Obama's "courageous" actions in denouncing Wright to those of King Henry II telling Thomas Becket where to get off 8 centuries ago. That comparison will likely not resonate with many voters. Tom Shales, Hendrik Hertzberg, Andrew Sullivan, and other members of this flack troupe are sure to chime in with their vigorous applause, and with pleas for the media to get back to the real story of George Bush's crimes against humanity. Barack Obama has been showing up at Wright's church for close to 20 years and was exposed to his brand of crackpot racist anti-American lunacy on more than one occasion during this long period. So it is really way too generous, I think, to applaud the Senator for his dramatic "Sister Souljah moment" with his late-to-the party denunciation of Wright. 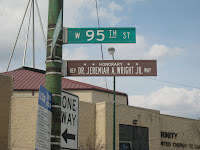 A real Sister Souljah moment would have required leaving Trinity Church before Wright became politically inconvenient for Obama, and not when Wright is beginning to threaten Obama's bid for the Democratic nomination. 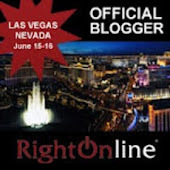 Falling poll numbers the real reason for Obama distancing himself from Wright? It sure makes me cynical. Chrissie Matthews, by the way, has a poor sense of history. Most of us know what happened to Archbishop Becket when Henry uttered "Who will rid me of this meddlesome priest?" Shortly thereafter four knights murdered Becket in during a service at Canterbury Cathedral.